To be honest, poker is not a game of luck, as many people may tend to think. Rather, it is a great skill game where only players with the right set of skills steal the show in the long run. 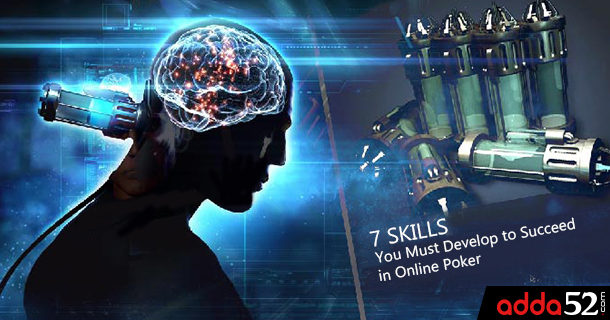 Some of the biggest and most successful skills that you as a player would need to win in online poker may include focus, patience, strategy, analytical mind, discipline, emotional stability, and of course psychology to win. To be honest, playing poker is a bit tiring. It is not uncommon for online poker players to sit and play long hours. True, online poker sessions may go for hours, sometimes they last for 12 hours, which may be tiring for players. It is for this solid reason that the ability to focus deeply for an extended period becomes a highly critical skill to win. If you easily get distracted, poker is perhaps not for you. Since poker is more a game of exploiting your opponent’s mistakes, you need to be patient and watch out for mistakes from your opponents. Keep in mind, patience is a valuable skill in poker, helping you to ensure that the hands you play are profitable enough. It is, therefore, important to have a patient approach for moving up levels to ensure that you as a poker player are successful in the long run. Well, being strategic in poker is what makes a great player. Yeah, you have to be a strategic thinker in poker to turn the game your way. Make sure you are able to think what your opponent has, think about what your opponent thinks you have and finally think about what your opponent thinks you think he has. Once you do this, you quickly need to devise a smart strategy to exploit your opponents at the table. You may exploit your opponents in various ways such as calling, raising, re-raising, etc. Again, this is a very critical skill to win in online poker. A lot of players who have strong background in strategy games like chess or other mind sports do really well in poker. It is not necessary to be a good chess player, but the ability to think analytically in pros and cons of a situation is always important for poker players. They should be good at reading their opponents at the table and at the same time they should be able to plan some quick strategies to win. If you have analytical mind, then poker is for you. Let us be frank, poker is a little bit about luck. There are days when you run good and start feeling that you are a great player and hence take shot at high stakes games, which are almost beyond your bankroll. Again, there come days when run bad and you feel like giving up poker. Therefore, it is crucial to maintain a discipline and play within your bankroll. This will really help you to avoid frustrations & failures. Emotional stability is the key in poker. In fact, it is a big part in the game and a lots of poker coaches work with players just for that only. There may be many stressful times when you lose money. Many players when they lose money, they become mentally unstable, lose their cool and don’t function normally in daily life. To lose money and still stay cool, enjoy sound sleep and function normally in daily life is the real skill that needs to be developed by poker players who wish to succeed in poker. Like in every aspect of life, your own psychology plays a key role in poker. Psychology is nothing but a skill to judge your own position in relation to others at the table. It is also your ability to influence the decisions of your opponents. In simple terms, it is about detecting when people are being deceptive to you. It is interesting to note that people who are good at psychology enjoy an average 53% success rate. Psychology becomes more significant in poker where deceptions and bluffs are very common.